I love Thailand and I love Thai food. 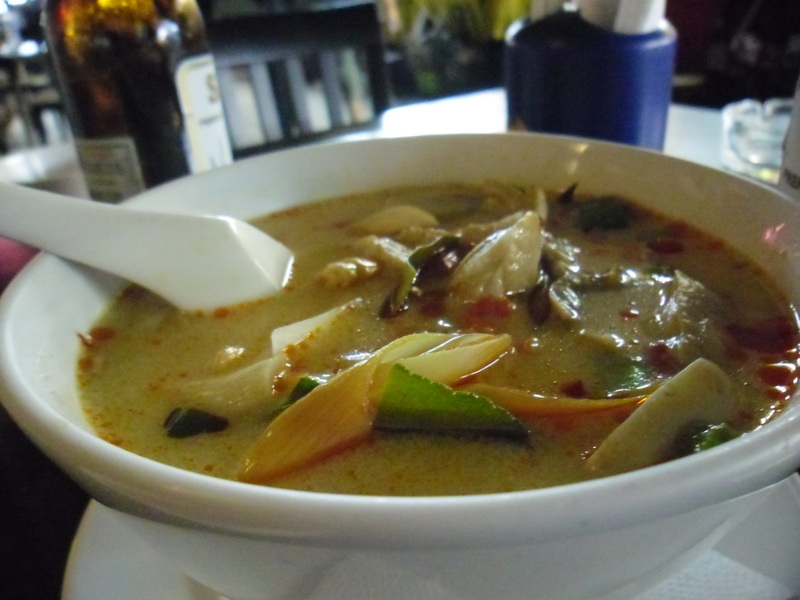 On a recent visit we decided to get the low-down on Tom Yum Kung, or Tom Yum Goon as it’s sometimes known in Australia, and the most well-known dish on Thai menus. 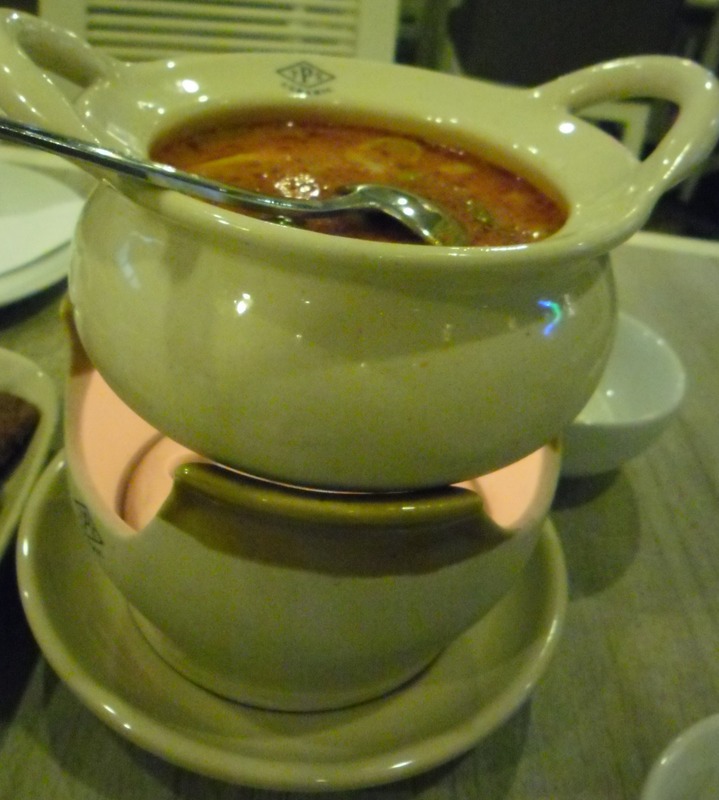 This hot and sour soup includes enormous prawns and is a popular starter for most meals and comes in a number of variations including Tom Yum Hed (vegetarian but contains mushrooms), Tom Yum Paa (with chicken), Tom Yum Thale (mixed seafood), and Tom Yum Nam Khon—a creamy version that contains coconut milk. After sampling the classic (Kung) dish in a number of Bangkok restaurants we finally managed to get the secret from Tip Top Restaurant at the Pat Pong Market. Hot and sour is the key to the soup and the main flavours come from chilli and lime. But there are also undertones of salt and this comes from the fish and soy sauces, and you should be able to detect the chilli, lime, salt, and to some extent ginger, in every spoonful of Tom Yum. We ate at Tip Top twice; the first night we ordered standard Tom Yum Kung which was perfect and it was here we finally noticed the different tastes within the soup—you could definitely taste the chilli and lime, and a hint of ginger. The prawns were large and plentiful, and the lemongrass was in large pieces which made it easier to avoid. The Kaffir Lime leaves were whole leaves—not shredded. The chilli was distributed throughout the soup so no random hot-spots, and it wasn’t ‘crying’ hot either. 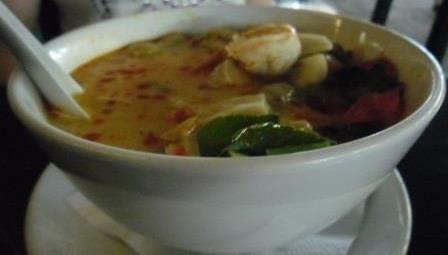 This was the soup that gave us our Tom Yum education and raised the bar for everywhere else. On our second visit we tried Tom Yum Hed and it was just as good. We also gleaned a recipe—of sorts—as it was very much a ‘toss in and taste’ and ‘what measure?’ conversation, and although there is a long list of ingredients it’s surprisingly quite easy to make, though balancing the individual flavours for the taste test is a tad more tricky. Ladle soup into bowls and sprinkle with fresh coriander. Extra chilli can be served on the side for those who prefer it really hot. This entry was posted in LFW Food&Wine on May 3, 2014 by gracienumber1.